With the G-Star 2018 running right now in South Korea, it's not an easy task to find some games that aren't developed for mobile devices – Aion 2 and Blade & Soul 2 say hi. DevCat is one of the few studios still working on PC games. The makers of Vindictus are developing two new games for Nexon: the sci-fi MOBA Ascendant One and the Monster Hunter multiplayer game Dragon Hound. This game was properly introduced to the world earlier this month and now some Korean press managed to get a lot of details on it, courtesy of the game's director. Dragon Hound is in development for PC using the Unreal Engine 4, and the core gameplay revolves around hunting. You shouldn't expect an MMORPG at all, since it is more focused (or restricted), probably with some similarities to Dauntless. It takes around 15 minutes to take down a large monster, 10 minutes for your average creature. 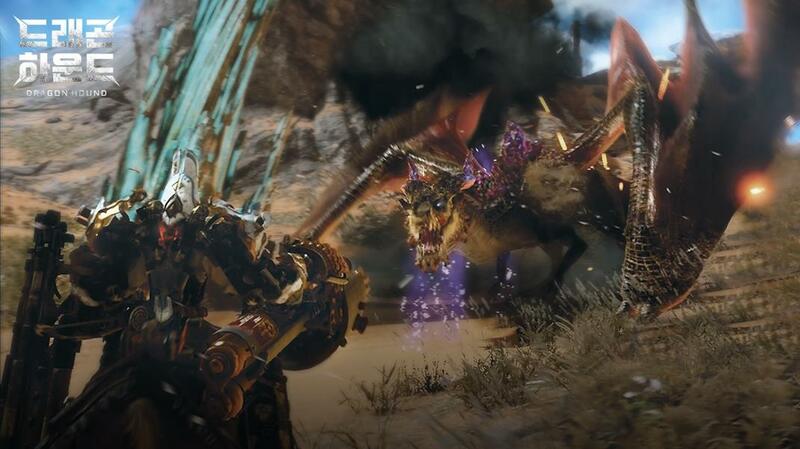 The game director says that Dragon Hound isn't only about Monster Hunter, preferring to call it a mix between Monster Hunter and World of Tanks. You can't get off your mount during combat, hence the World of Tanks comparison – he says that we should see the player character as a centaur. Dragon Hound's hunting areas are larger than those usually seen in Monster Hunter, and the monsters are equally bigger. Quite shockingly, DevCat has no plans for PvP in Dragon Hound. This is more of a team-based multiplayer online game, but some features such as tower defense still require a large number of players. Dragon Hound's monsters include damageable internal organs such as heart, eyes and lungs, and these are important in your fight to take them down. You can aim at these parts to end the fight quickly, and some missions require you to harvest organs. Some monster limbs can also be destroyed, resulting in limited movements or attacks. So far, the monster count is around 30 different species. There is no weapon restriction to classes, which means that you can equip whatever weapon you want. There are melee weapons as well, such as a chainsaw, and it is up to players to choose what is best. Technology in Dragon Hound is said to be at an equivalent to World War 1, although it has a much more steampunk feel to it. Finally, the villages in Dragon Hound are floating (hello again Dauntless), and their positions switch once a week, making for a limited window of opportunity for some encounters.